The wind hammered Yaverland Beach, Sandown on the Isle of Wight last Sunday for the finals of the windsurfing slalom, wavesailing and kitesurfing competitions. The cross shore conditions, at Yaverland Beach, Sandown on Sunday 2 November made the BKWA slalom a tough race. 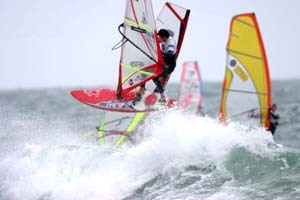 Jamie Lever stormed into first place and won the final, fighting off stiff competition from Xavier Ferlet and Dan Ellis over the course which ran from Sandown, round a buoy in the bay finishing in the surf at Yaverland Beach. With a windspeed of between 35-45 knots cross shore, the conditions couldn’t have been better for the nailbiting final of the UK Wavesailing Championships at Yaverland Beach last Sunday, 2 November. John Skye won the title of UK National Wave Champion coupled with bagging first place in the expression session earlier in the week, he secured his position as wave and freestyle champion for the event. In the ladies event Shawna Cropas beat Louise Emery (current overall freestyle champion) to prove her place as the best female UK wavesailor. Gale force winds enjoyed by the windsurfers were just as welcome on the kite surfing side of the competition. The final was charged with excitement as the 35-40 knot blasts gave finalists the height to pull off some amazing tricks. Ludo Brockway was the victor in the men’s division while Kirsty Jones proved her undisputed British Champion status once again for the women’s final.